Beautiful holiday home with plenty of privacy. You have a lovely terrace with comfortable furniture where you can enjoy that wonderful view regularly. It is also wonderful to relax with a glass of Ardèche wine and your meal cooked on the BBQ in the evening. The décor is very modern but the owner still managed to retain the authentic atmosphere. 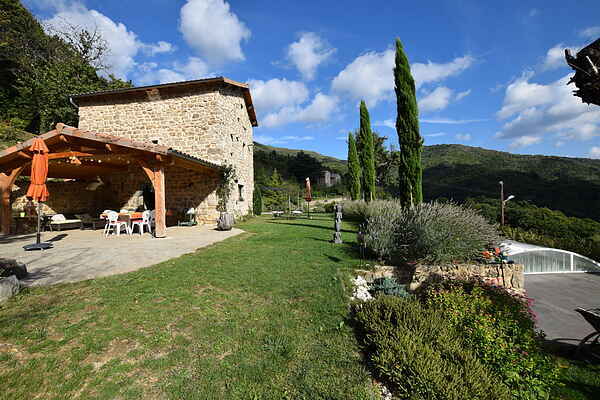 We selected this beautiful, recently renovated (2011) holiday home for the real nature lover. Again and again you will be surprised by the stunning views of the surrounding densely wooded mountain landscape. There is a lovely, heated private pool with Roman steps and outside shower and around the house is a gorgeous big garden. Do you want to use the heated swimming pool? Inform the homeowner before your arrival (extra heating costs, € 0.15 per kW). The village of Burzet is just one kilometre away. Do take a trip by car. Here are a few tips: Mont Gerbier-de-Jonc (20 km). This is a high accumulation of rocks with an altitude of over 1500 meters. What you also should not miss are the wild waterfalls of Ray-Pic (10 km) of at least 60 metres high. The towns Vals-les-Bains with a famous spa and Aubenas (both 25 km) with a historic castle are also highly recommended.